The steel buckle incorporates 16 tools, including a ruler, box cutter, screwdriver, and bottle opener. Belts aren't content just holding up your pants. They want you to know they're destined for greater things: Measuring the width of a paw print in the woods, tightening a loose screw on a canoe, cutting twine away from a cord of firewood, and when you're done with all that, opening a beer. 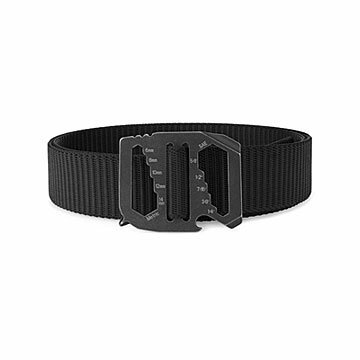 The 16-tool steel buckle on this belt does it all, and more. Made in Oregon. Hex tools both Metric (6mm - 14mm) and SAE (1/4"-5/8", Large and Small Flat screwdrivers, Phillips head screwdriver, Box Cutter, Wire stripper, Bottle Opener, Standard and Metric ruler.